As difficult as it is to believe, 2014 marks the 30th anniversary of Wes Craven’s A Nightmare on Elm Street (1984), the horror film that introduced the world to dream monster Freddy Krueger (Robert Englund). 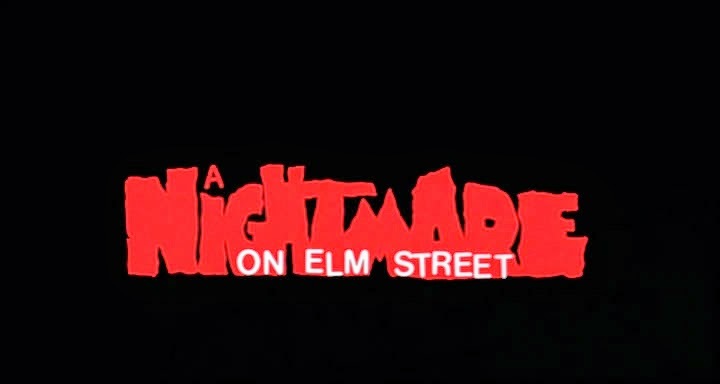 Historically-speaking, A Nightmare on Elm Street is significant not merely for commencing a franchise that came to include five direct theatrical sequels, but a two-season TV anthology, Freddy’s Nightmares (1988 – 1990), a nifty re-imagination in Wes Craven’s New Nightmare (1994), a cross-over, Freddy vs. Jason (2004) and a misguided re-boot in 2010. The Freddy series put New Line Studios -- “The House That Freddy Built” -- on the map, as well. 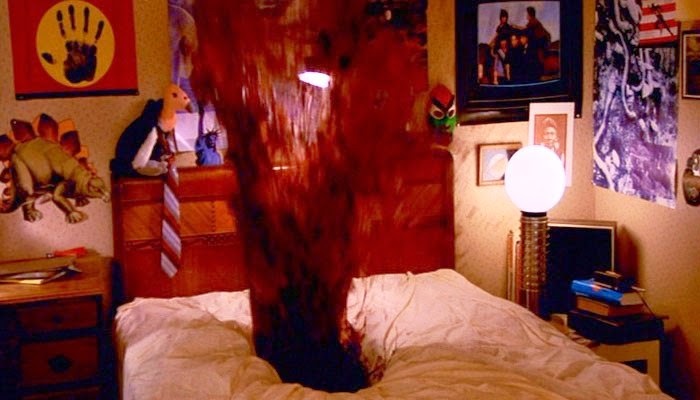 In a broader genre context, A Nightmare on Elm Street was the rubber-reality venture that ended the long reign of the naturalistic slasher films of the early 1980s; films with titles such as Happy Birthday to Me (1981) or My Bloody Valentine (1981). Those older films eschewed supernatural horrors, and focused on mad-dog killers (usually in masks) who killed teenagers with very sharp implements. The killers were largely silent killing machines, without much by way of personality. The slashers’ episodic nature remained intact in A Nightmare on Elm Street’s modified “rubber reality” format, but in general, rubber reality tales (like Hellraiser , for instance) were buttressed by more imaginative special effects, and supernatural, loquacious monsters. Eventually, even the ultra-naturalistic Friday the 13th film series moved towards more rubber-reality-type fare because of Freddy’s re-direction of the genre. 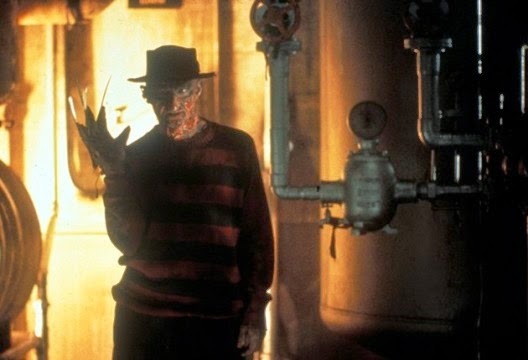 In just a few short years, then, Freddy Krueger became the king of American horror films, and a pop culture sensation. The modern, 21st century horror film has moved back towards a more naturalistic setting and tone, in large part due to the success of the found-footage sub-genre, and so Freddy today seems like a character who perfectly captures his particular era: the 1980s. The relative quality of A Nightmare on Elm Street’s sequels has been debated up and down, again and again, even in the Wes Craven movie Scream (1996), but the original film remains a powerhouse of terror, even thirty years later. The 1984 film has lost none of its atmosphere of mounting, pervasive dread, and Craven’s imaginative style and content continues to impress. 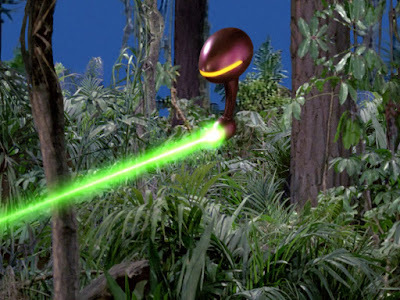 The film’s artistic success is based on a few crucial factors. These observations about A Nightmare on Elm Street seem right on target, and yet for this critic, the film always resonates because it globally applies its surface vs. reality conceit. In other words, A Nightmare on Elm Street concerns both the appearance of reality, and the true reality that dwells or roils underneath that (false) appearance. Virtually every aspect of the cinematic tale can be studied utilizing this particular bailiwick. Impressively, A Nightmare on Elm Street even finds a literary precedent for this conceit, and frequently references the works of Shakespeare, mostly Hamlet, but also Julius Caesar. 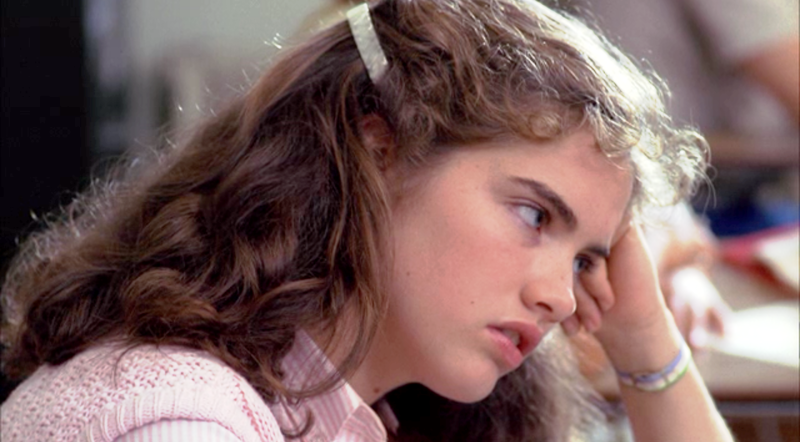 In addition to this thematic virtue, A Nightmare on Elm Street remains a turning-point in horror history, I submit, because the “final girl” archetype, -- here represented by Heather Langenkamp’s Nancy Thompson -- finally blossoms to full maturity. Although Jamie Lee Curtis’s Laurie Strode survived her experience with boogeyman Michael Myers in Halloween (1978), Nancy’s battle with Freddy in Nightmare is determinedly different. At some point in the crisis, Nancy takes control and responsibility for her life and her struggle, and defeats Krueger on his own terms. Nancy does so using her insight, resourcefulness, and planning…not just by a lucky turn of fate. This fact is perfectly dramatized when one contrasts the “High School English Class” scenes featured in the Carpenter and Craven films. The former is about fate, and the way that fate determines action and destiny. The latter is about a hero (Hamlet) digging for and excavating the truth against great odds and entrenched power. One scene is about surviving by circumstance, the other is about actively participating and re-shaping your own future. Nancy is a hero, then, who takes responsibility for her survival in an affirming, powerful fashion. A high school student, Tina (Amanda Wyss) becomes obsessed with a recurring dream. At night -- every night -- she dreams of a stalker in a fedora and red-and-green-sweater. He is armed with a razor-tipped glove. Tina discovers that her best friend, Nancy (Langenkamp) is experiencing the same nightmare, about the same boogeyman, and holds a sleep-over at her home when her mother goes out of town. Also at the sleep-over are Nancy’s boyfriend Glen (Johnny Depp), and Tina’s juvenile delinquent beau, Rod Lane (Nick Corri). When all the teens are asleep, the nightmare man strikes Tina and kills her brutally in her dream. Rod is arrested for the murder of Tina by Nancy’s father, Detective Thompson (John Saxon), but Nancy is convinced that he is innocent, and that the dream stalker is “real,” and responsible for the crime. Nancy presses her alcoholic mother, Marge (Ronee Blakeley) for details. She learns that some years earlier, the parents of Elm Street hunted and down and killed a man, Fred Krueger (Englund), who was a child murderer but escaped justice on a legal technicality. The Thompsons and the other parents burned him alive, but kept his hat and finger knives in Nancy’s house -- in the furnace -- as a kind of trophy. The murders on Elm Street continue, and Nancy realizes she must take affirmative steps to defeat Krueger and stop his plans to kill her. But should Nancy proceed as her boyfriend, Glen, suggests -- and which goes against her nature of “digging” and confronting the truth -- and turn her back on Freddy…thus robbing him of the energy she gave him? In blunt terms, A Nightmare on Elm Street concerns the surface, and the underneath or “truth” that co-exists with that surface. Many aspects of this Craven film visit and explore this duality, or double nature. We detect this duality in terms of location, both with the suburban high school that seems normal, and the sinister boiler room underneath it, where Freddy rules. 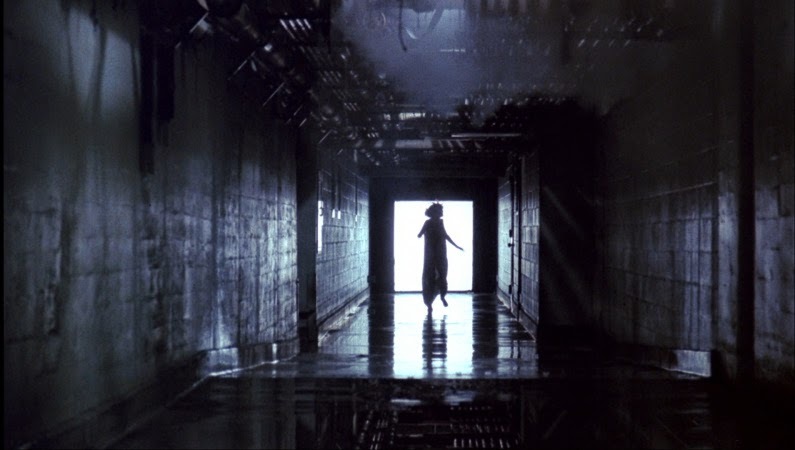 Many of the film's most terrifying scenes are set in dark labyrinth, or maze-like basements, a connective tissue between the surface above and the truth below. We see the same duality in the real world, where people are presumed safe and protected by the rules of consensus reality, and the dream world, where there is mortal danger. You die in your dream, you die in real life. We see the duality in the Elm Street parents, who profess propriety and adherence to law and order, but who are, in fact, murderers. We even see it in regards to morality. Again, the Elm Street parents have crafted a world of apparent moral absolutism (where Christ on the cross protects teenage girls’ in their bedrooms…), but they actually practice moral relativism. For example, Lieutenant Thompson uses his own daughter, Nancy, as a pawn so as to achieve his goal of apprehending Rod Lane. Similarly, Marge Thompson sees the murder of Freddy as the parents' "right" because the legal system failed to arrive at the conclusion they preferred. Throughout A Nightmare on Elm Street, then, there exist two lines or tracks to keep abreast of simultaneously: reality as it appears to be true, and reality as it actually is. Craven's conceit here was extremely timely, and reflected something larger -- and disturbing -- happening in American 1980s culture. As the authors of Landslide: the Unmaking of the President (1984 – 1988) wrote of this time, the new (Reagan) administration said it was possible “to cut taxes, and increase defense spending and at the same time, fight terrorism, roll back Communism and the threat of nuclear war, all without risking American lives. Reagan seemed to be offering a miracle cure.” (Houghton-Mifflin Company, 1988, page 11). Again and again during this time, symbolism (or rhetoric) and reality clashed. The new Administration promised to reverse the growth of an out-of-control Federal government, but after two terms under its control, the Federal work force actually expanded by over 60,000 employees. The same administration promised tax cuts, but actually raised taxes three times: in 1983, 1984, and 1986. What is the price when actions don’t match words or symbolism? It’s fairly simple to calculate. From 1980 to 1988, America countenanced a staggering 2.7 trillion dollars in debt, roughly 200 billion dollars a year. Who was going to pay that debt? Future generations of course, and that’s precisely where the direct comparison to Freddy and his behavior comes into play. After all, Freddy is all about visiting the sins of the father upon the children. He explicitly doesn’t go after the surviving parents of Elm Street (save for Marge in the finale…), but instead punishes those parents by taking their children away. A national debt of the egregious size we racked up in the 1980s was, similarly, a visitation of the sins of the fathers upon the children. It was the kids who would be faced with paying the piper. Other epochs and other decades bring other bugaboos. A whole raft of horror films from the 1970s, including Dawn of the Dead (1979) seem born from Carter’s “Crisis of Confidence” malaise, for example, and 1950s horror films, in general, arise from fears about the 1940s detonation of atom bombs in Japan. So partisanship has nothing to do with it. Reaganomics is simply, in some sub-textual way, the basis for the sub-surface fears expressed in A Nightmare on Elm Street. As a protagonist, Nancy Thompson fits perfectly into this discussion of reality vs. symbolism, or surface vs. reality, if you prefer. Like the Prince of Denmark, she digs and digs, uncovering lies and murder, until she gets to the truth behind all the death and corruption. She discovers that her parents are murderers, and worse, that they are okay with the fact that they took the law into their own hands. Their protestations of righteousness are hollow-sounding lies. And it is here, in reckoning with those lies, that Nancy realizes no one can help her. The police are powerless to stop Freddy, because he operates in his own reality. Her parents are similarly helpless, because they are either alcoholic, are unwilling to listen to their child’s fears. And at a dream clinic, scientists also prove unable to help Nancy survive against the looming threat to her very survival. So Nancy learns the hard-lesson in A Nightmare on Elm Street that the older folks aren’t going to help her. The Establishment, as it stands, is unwilling and unable to confront the truth, and solve the problem in an effective fashion. In a sense, her parents have already sold her and her friends out. Their illegal behavior – their solution to the problem of Freddy -- has given Krueger license to hunt and murder their children. Nancy’s task is to see past the rhetoric and lies, and figure out a way in which she makes it forward. This task resonates not only with what was happening to the American economy in the eighties, but in terms of the Cold War as well. Nuclear War was never more than the push of a button away in this age, and the young generation wanted no part of it, and sought solace in what older generations called "death metal" and "dead teenager movies." Again, the parents who brought the world to the brink of war might be viewed as culpable for creating that “demon,” while the younger generation, represented by Nancy, had to carry the burden of knowing that death -- apocalypse -- could come at any moment. Freddy -- Craven's "bad father" -- is the avatar for all these generational fears; but particularly the fear that the world is fucked up, that it isn't your fault, and that, without doubt, the world is going to come and kill you. What we are left with here, then, is a reckoning with the idea that society can’t continue -- that teenagers can’t grow up safely -- in the full light of reality, because it is too unpleasant. There are some things that are so horrifying that it is necessary to turn away from them. But does turning away from them mean burying them? Does turning away mean medicating yourself to a state of numbness? Some amount of denial may be desirable, healthy even, but first you must know what you are denying. Nancy must learn when to dig for truth and when to turn away from the lies and corruption she finds. So, in some weird and very eighties way, A Nightmare on Elm Street is about growing up, and finding your own way to navigate a messed-up world. All the sub-textual currency in A Nightmare on Elm Street makes the film pulsate with ideas and cultural fears, but what is actually seen on screen is…visceral. The death of Tina is one of the most horrifying and remarkable death scenes ever put to film (with Glen’s a close second, perhaps). Tina’s death is violent, irrational, and based on the idea that a reality ignored is a reality that is dangerous, or deadly. An unseen assailant rips the beautiful teen apart, and razor cuts “happen” to her, because her parents have not been able to help her, or acknowledge the truth about the danger she faces. Future Elm Street films boast far more elaborate death sequences, but for my money, Tina’s remains the most effective in the entire franchise. Her murder galvanizes the senses. It terrifies. It goes so far beyond the pale -- and beyond rationality or Physics -- that viewers realize they have crossed over into a whole new world of terror. A Nightmare on Elm Street succeeds as rubber-reality and as horror film because it brilliantly charts the overlap between real world and dream world in ways that are shocking, and yet simultaneously familiar to us. We've all had that terrible dream in which we are being chased, and our feet sink into the ground, delaying and jeopardizing our escape. Craven harnesses that universal image for a chase scene here, in which a staircase turns to goo under Nancy's feet, and Freddy looms nearer. 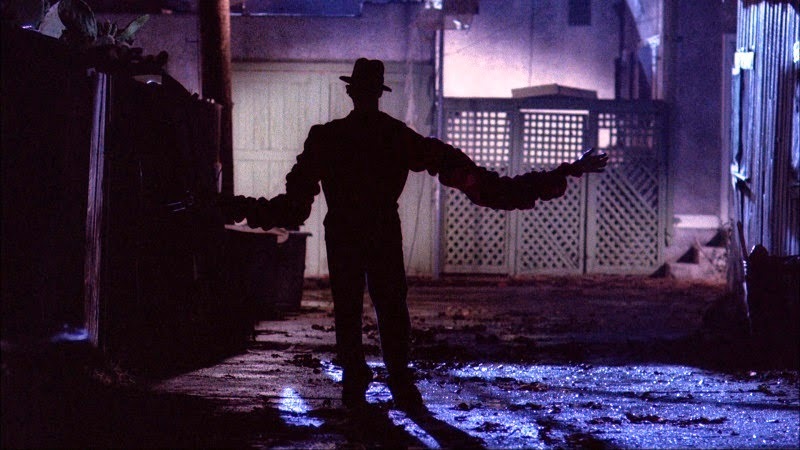 Another universal image of terror involves Freddy -- just an unformed shadow -- in a dark alley. He is a menacing but vague boogeyman who suddenly grows even more menacing, as his arms stretch and stretch to inhuman proportion. There's something very basic or primeval about this vision, of arms growing longer and longer to entrap their prey. And because Freddy is silhouetted, we can pour all of our various fears into him. He can be a bad father, a child murderer, a supernatural entity, or all of the above. As a reflection of timely national fears and universal "nightmares," A Nightmare on Elm Street still succeeds wildly today...much more so than its unfortunate remake. The film also represents a milestone in terms of the horror genre's portrayal of women, and is highly effective in generating its terror. Long story short: thirty years later A Nightmare on Elm Street is still bloody good.